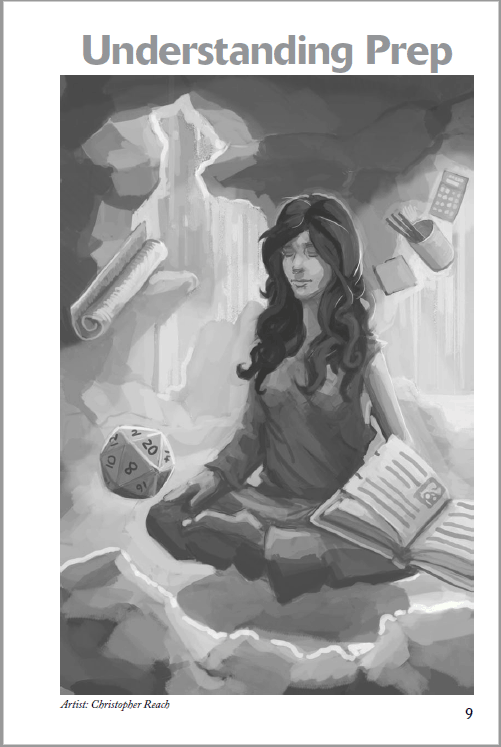 Never Unprepared - Classic RPG book review revisited. 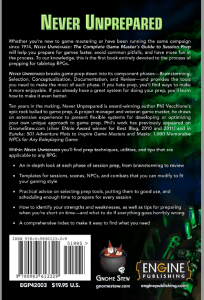 You are here: Home / Reviews / Never Unprepared – Classic RPG book review revisited. Never Unprepared – Classic RPG book review revisited. 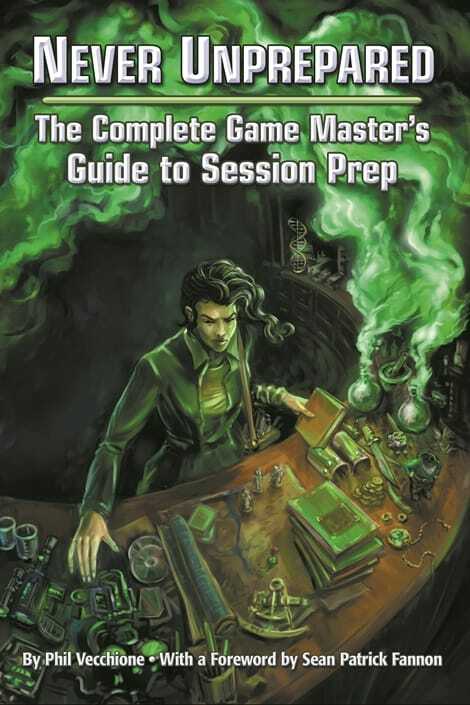 This week I’m looking back, way back, to December 2012 when I reviewed an excellent book for roleplaying game Game Masters called Never Unprepared: The Complete Game Master’s Guide to Session Prep. 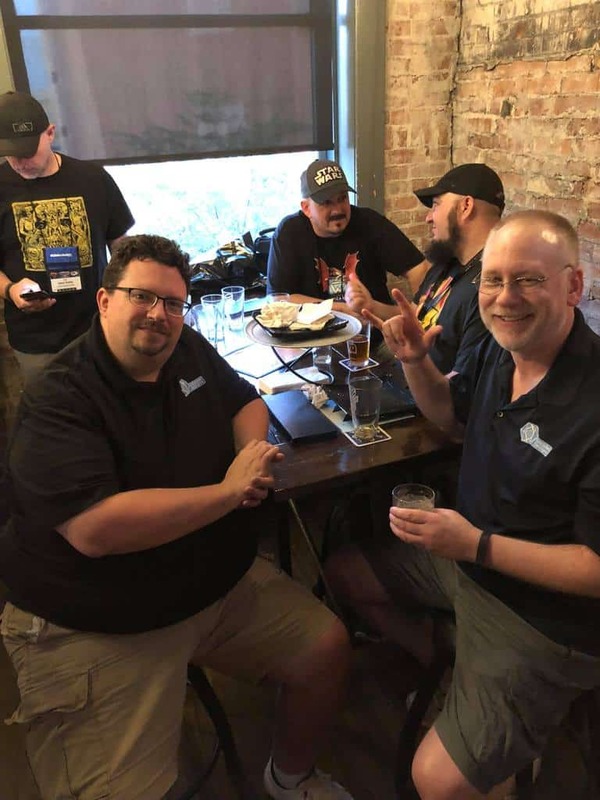 Welcome to #ThrowbackThursday, a regular feature here at Tabletop Bellhop where I’m going to dig up something I wrote in the past and re-publish it. We’re practicing review necromancy. My plan is to repost the original review with only minor editing. I want to keep the feel and tone of the original post. I will also try to include any original photos (though in this case, the only image in the original review was the book cover). I will, at times, insert comments, you will find these in [square brackets]. At the end of the original content, I will follow up with some current thoughts on the topic. Disclosure: Some links in this post are DriveThruRPG Affiliate links. As an associate, I earn from qualifying purchases. 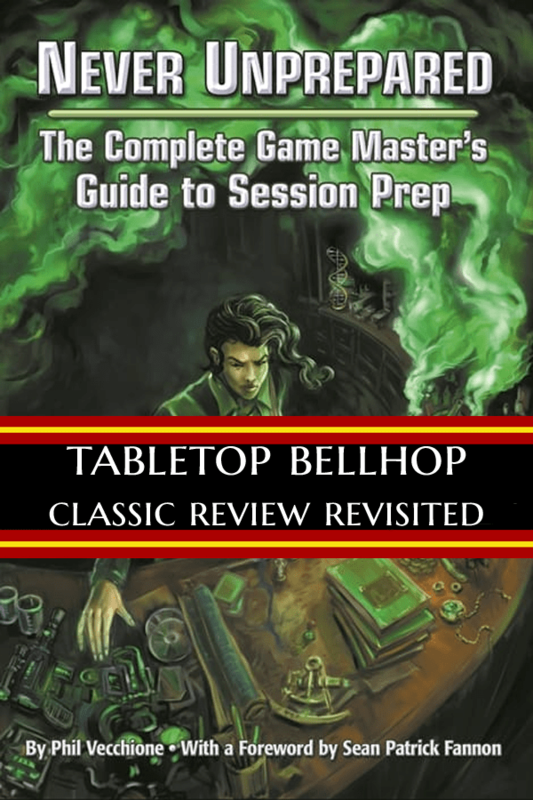 The main reason I chose to resurrect this review of Never Unprepared: The Complete Game Master’s Guide to Session Prep is because Sean and I will be interviewing the author, Phil Vecchione, on Tabletop Bellhop Live on October 25th (at 8:30pm EDT). We aren’t interviewing Phil about this book, but rather his new roleplaying game Hydro Hacker Operatives (aka H2O) but I thought it would be cool to dig up this book from Phil’s past and see how it stands up. Looking for the perfect gift for the Games Master in your life? Want to bring some holiday cheer to your gaming table? Looking to convince your DM to round up that last 100 XP so you can level before the New Year? Never Unprepared is the perfect gift for the [person] behind the screen this holiday season. I’ve been sitting on this review for quite some time. 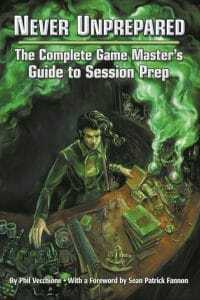 I finished reading the pdf of Never Unprepared: The Complete Game Master’s Guide to Session Prep well over a month ago now. The thing is that I really wanted to put all of the great advice in there into practice and see the effect it had on my games before writing this up. As is usual things didn’t go as planned. Shifting schedules, changing groups and lots of other mundane boring things got in the way. I’m still working on it though, I think the book has some valuable advice and I really want to give it a real try using all of the steps. Just the way things are going it’s going to be a while. So this review is written while adopting the Never Unprepared methodology is still a work in progress for me. Never Unprepared is a 131 page PDF or Softcover book [I have the PDF] published by Engine Publishing and written by Phil Vecchione. Game preparation is a topic you do not see covered very often at all, maybe on forums or blogs but rarely in published products. This is the most detailed look at the subject I’ve ever seen. In addition, it’s written by a true professional. Phil is a Project Manager and deals with time management and organization for a living. It’s very interesting to me, with a background in quality, lean, and problem-solving to see these tools applied to gaming. The book starts with a forward from Sean Patrick Fannon, an introduction and a couple of pages on how to use the book. It then dives into prep head first with the largest portion of the book: Understanding Prep. This is followed up by a Prep Toolbox and a section on Evolving Your Style. The books wraps up with a conclusion, references, index, and biography. It’s the three middle chapters that we really care about, Understanding Prep, Prep Toolbox and Evolving Your Style and I will take a quick look at each. [This] is the “Guide” part of the book. Phil puts forward a very structured method of game preparation based on tested project management techniques. After a lot of talk about theory, he gets into a working methodology that involves five stages. With Phil’s method, proper effective game prep starts with Brainstorming. Here we see the usual Blue Sky, accept every idea, and don’t throw anything out, style of idea generation. The most interesting part of this to me was that Selection is the next step and not part of Brainstorming at all. During Selection you riffle through all of your brainstorming ideas and pick the on that will be best for your game. During Conceptualization, you flesh this idea out. Here’s where most of the work that people think of when you say Game Prep happens. This ‘work’ continues in Documentation when you make all the physical notes, maps, and artwork for your upcoming game. Last is a step I’ve never even really considered before and one that Phil, thankfully, goes into in some detail: Review. Here we are presented with a concept where we go over all of our prepared material. We do this not just to read it over and memorize it, but also to edit it. The breakthrough concept here though is to go through it as three different types of editors. We first look for spelling, grammar, and structure as a Proofreader. Once proofed we review again as the Director making sure the story works and flows and makes sense with the overall campaign. Lastly, we play through our notes ourselves as the Playtester. This part of the book really struck me as novel and great advice. 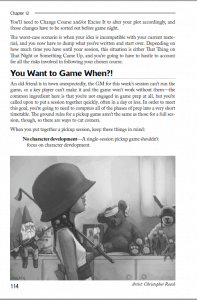 I think one of the most valuable parts of the Understanding Prep section of the book is that Phil presents an open method that [can] be used by any type of gamemaster. It’s not a codified set of hard rules that you have to follow step by step. It’s an outline of a methodology. GMs who are used to running with five bullet points on an index card can get just as much use out of this method as the GM who brings a full three-ring binder full of notes to each session. This section talks about the tools you can use to facilitate the steps in the Understanding Prep section. This section was a bit of an eye-opener for me as well. I never really considered how much easier it would be to prep with a nice pen and an organized binder to keep all my notes in. Where I’m not searching for a scrap of paper to make notes on and even worse trying to find that scrap minutes before the game starts. This section talks about these kinds of things. How do you take notes? Where? How do you organize them? What I really liked here was how modern the suggestions are. Lots of digital tools are suggested and it’s excellent to read a book like this and find a new use for Dropbox. Phil actually discusses paper vs. electronic at length. [Phil] puts forth arguments for both sides [old school paper and modern tech] and fully understands that everyone is going to have their own preference. The Toolbox section of the book is also the most philosophical. Chapter 9: Mastering Your Creative Cycle looks at your non-physical toolbox, your mind. Here Phil gives you a method to figure out when you are your most creative and how to use that energy. What I found fascinating here is that the answer isn’t just “prep when you are most creative”. The method described suggests mapping your creative energy and fit the various preparations tasks (as outlined in the Understanding Prep section) into your different highs and lows. When writing NPC descriptions do that at a high creative time. Lunchtime at work, your juices are low but you have some time, well that’s the perfect time to do something logical and mechanical and stat out those NPC. This section takes a look at how to take all of the previous information and personalize it. Phil has you look at your strengths and weaknesses as a GM and then gives you a method of documentation that will help bolster these weaknesses and emphasize your strengths. Again the paper vs. digital debate is brought up and the book really helps you hone in on what you really need and what you can skip over. From here the book takes a realistic approach. There is a discussion on what to do when you don’t have enough time to put into effect all of the methodology presented in the book, called the Prep-Lite Approach. This is very detailed and has a specific suggestion for what happens when you under prep in each area and how to compensate. A section on prep in the real world continues with suggestions and a lot of excellent reactionary measures you can take when things don’t go as planned. Never Unprepared is a nice looking book. [It has an ] evocative cover and lots of well placed well drawn black and white art. The index is a nice touch and something I wouldn’t expect in a book like this. I personally read a PDF copy and my favourite part was the fact the book was well hyperlinked. The links not only included material in the book but also external links to many of the tools discussed. I’m always impressed when a digital copy of a book actually offers me more functionality than just a scan of a dead tree product. Here’s what I’m sure everyone is interested in. How has this book helped me with my own personal games? Well, so far it has all been positive, though I’ve yet to really do more than scratch the surface. I think the first and most important thing this book does, more important than any individual step is getting you thinking about game prep and how you do it. Even if you never use a single step in the book, just sitting there and thinking about how you prep while reading the book is invaluable. As noted by Phil, [game prep is] something we just don’t normally talk or think about, it’s just something we all do our own way. Analysing how I prep and thinking about how to make it better has helped me significantly. The first thing I did after reading the book, being inspired to improve my method, and looking to find enjoyment in the act of prepping, was to look at the tools I use. The first thing I noticed is that I do brainstorming for my games all the time, at random times. At work, while driving, while waiting in line, in the shower etc. The one thing I never did though was document any of this. I now realize this means that many times I am losing good ideas. So my first task was to find some way to document [my prep work]. So I crowdsourced. I went on Google+ looking for suggestions. For now, I’ve settled on Evernote on my iPod. Next, I went and bought a new binder/organizer for my two current games. Something with dividers, a built-in calculator, notepad, 3 rings, file folder all in one. No more will I be writing notes on loose scraps of paper only to not be able to find them before the game. So far, this has worked great. 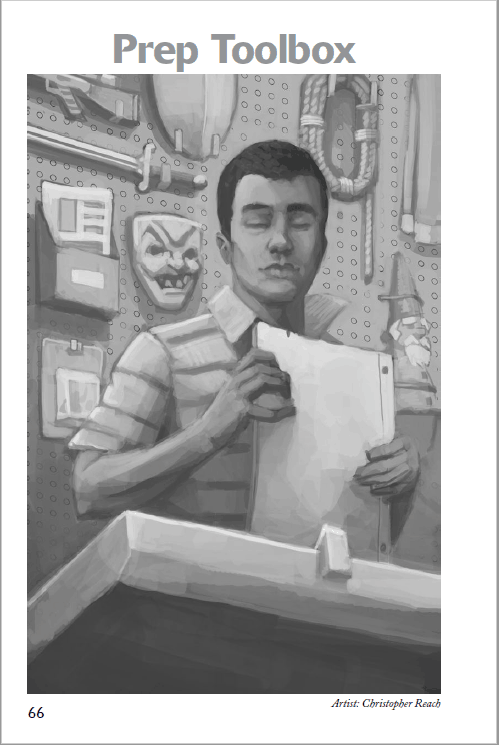 I’ve run four sessions since having made the binder and I’ve yet to spend the first half hour of the game scrambling trying to find my stuff. In addition to this, I’ve not formally sat down and done any of the review steps one by one but I have a mind for these things now. I find that while working on conceptualization I am a lot more aware of making logic errors in my story. I realize the importance of permanence in the game world and avoiding any “oh that place was supposed to be 2 days away… right…. sorry, yeah it’s a 2 day trip” moments. I want to improve my documentation and really want to find the time to sit down and make custom templates to use during my documentation phase. I just haven’t found the time. I really enjoyed the section on mapping your free time and figuring out your creativity schedule. The problem is that it only seems to work for people who have a regular schedule in their nongaming life. It’s great for people who work 9-5 and eat dinner around 6 every night. It’s not so great for people like me, whose work schedule next week is 7-3 Monday, 3-11 Tues-Thurs, 9-5 Friday, 7-11 on Saturday. I don’t find out what my work week will be like until Thursday the week before and it’s always changing. I often work three or four different shifts in a seven day period. Due to this, my free time becomes “When I can find it” and my Creative Cycle is pretty much irrelevant. So this section of the book, while interesting, I found pretty much impossible to put into use for myself. Maybe at some point, I should write a book: Chaotic Preparation: The Complete Guide to Game Preparation for Shift Workers. Overall, I was very impressed by Never Unprepared. It had an immediate impact on my game preparation and an immediate positive impact on my next game session. While I’ve found it hard to implement everything in the book, the small steps I have taken have all showed noticeable reward. Based on this I’ve decided to continue trying to adopt more and more of Phil Vecchione’s preparation methodology. Heck, maybe someday I’ll even figure out that lunch time on Midnights is the best time for me to draw maps. I strongly suggest this great GM toolbook to anyone who ever plans to run an RPG. Even if you can’t use every suggestion, the act of reading through it and questioning yourself along the way is well worth it. At this point, I read this book a long time ago. I don’t even remember what two campaigns I was running at the time or where those binders I mentioned ended up. I think one may have been using the Pathfinder Beginner Box, I have no clue what else I may have been running. I do remember trying to use more and more of Never Unprepared as time went on. I also remember that with each new tool I took from the book and put in my GM toolbox my games got better. I actually did a quick re-read of the book before republishing my initial review, but there really isn’t a lot more to add to what I said back then. The one thing I did notice that I failed to mention was the quizzes. At the end of every important chapter, one that introduces a new concept, Phil has the reader do a short quiz. A self-assessment. Each time it’s on two different things ranked out of 5. You end up with a total of 2 to 10 with 2 being Unskilled and 10 being Mastery. For example, the first quiz is on brainstorming and has you assess the Frequency you use the tool and the Strength of your brainstorming activities. I couldn’t help doing these tests in my head as I re-read the book. I do wonder how my scores I gave myself now compare to those I gave myself in 2012. Another note that I think I missed the first time around. Near the end of each section, Phil talks about “When we do too little” and “When we do too much” when using a particular tool. I think this is important, as it really shows off that the book isn’t just telling you that more prep and more work is good. It’s all about finding the right balance and doing too much can be just as bad or worse than doing too little. By far the strangest thing about reading Never Unprepared now is the fact that I know Phil. I didn’t know him when I wrote this review in 2012. Phil Vecchione was just a name on a page. It was Martin Ralya that approached me about doing the review. I didn’t know Phil from Adam. Today I like to think I know Phil well. I’ve listened to Phil on the Misdirected Mark Podcast since he joined the show in 2014. I’ve met Phil at a few different cons. I’ve had dinner and drinks with Phil. I’ve played games with Phil. I consider Phil a friend. It was fascinating to get a glimpse into my friend’s past. That added an entirely new dimension to reading Never Unprepared. Phil has changed a lot since then, we all have. For one thing, Phil is now much more of an improv GM and I highly doubt he spends many nights going through his own process of Brainstorming, Selection, Conception, Documentation, and Review. Maybe we will find out during our interview on Thursday, October 25th. I think the growing number of no-prep games has also lead to a decreased need for the high structure pre-work you will find in this book. I still think it has value, quite a bit of it. There are still plenty of people running games that can benefit from proper preparation. Plus I think even for those of us running off the cuff, there is value in the introspection this book has to offer. 2013 Origins Award nominee for Best Game-Related Publication. 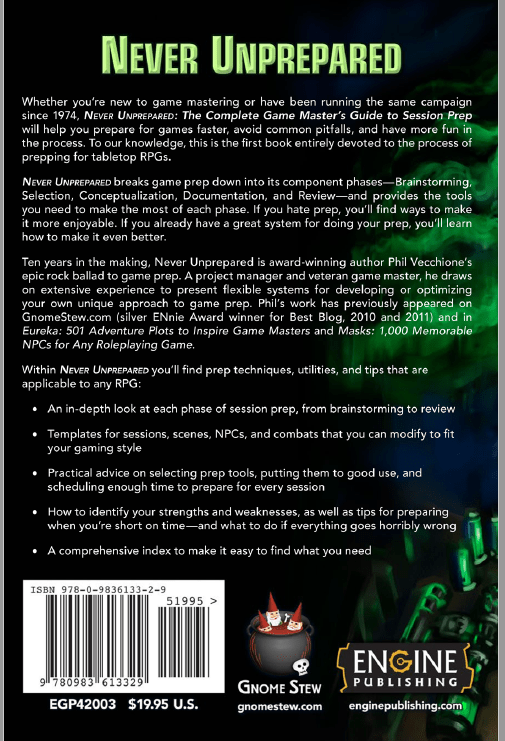 So, that was my look back at Never Unprepared: The Complete Game Master’s Guide to Session Prep. Have you read the book? What is your method for prepping for your next game? Let us know in the comments below.